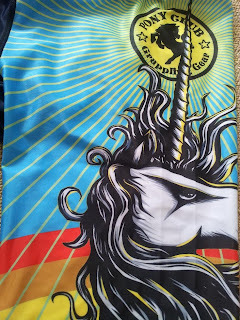 Short Review: For lovers of colourful kitsch, there is little on the nogi equipment market to rival Pony Club Grappling Gear's spectacular 'Jessica' spats, featuring a Meerkatsu designed pair of unicorns complete with a rainbow. The material is tough but smooth: it's also both tight and stretchy, so be aware the sizing differs as a result. 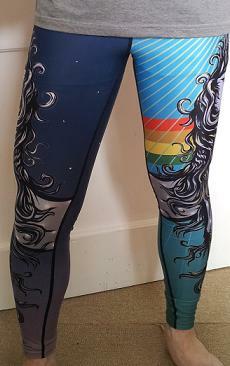 Compression legwear is a considerable change if you're used to training in a rashguard and shorts/gi trousers, but after a few weeks of rolling in the Jessica unicorn tights, I've been converted. The Jessica is available to buy (while stocks last) here, for $65. For a slightly lower $50, you can plump for the less flashy Yang and Bader spats. Full Review: Among the things I love, three rank highly: '80s music, '80s cartoons and grappling. Pony Club Grappling Gear, as you can probably tell from the name, manage to combine all three with their fabulously kitschy artwork. I've stuck the PCGG patch on my BJJ-patchified hoody and have been proudly wearing the t-shirt for several months. However, despite the fantastically bright logo, the PCGG t-shirts are currently available in the 'safe' colours of black, grey and white. It's an understandable move for a new company, but I was therefore very excited about the distinctly not-grey 'Jessica' grappling tights. The company was founded in Australia by Reem Fekri, who late last year earned her BJJ blue belt there, under Eduardo Dias and Ricardo Franca at Garra BJJ. Fekri studied at several universities in the UK and has a background in art and journalism, which no doubt served her well when both deciding on the design ethos and promoting Pony Club Grappling Gear. It might also explain neat little details, like the quote running along the waistband of the tights. Fekri is currently based in Dubai. These are the first grappling tights I've either worn or reviewed, meaning I can't help doing some research into their history (to skip my waffling on that topic and get to the discussion of the Jessica tights, click here). In an effort to find the earliest mention of 'compression leggings' on the net, I limited the search to between 1980 and 1995. That brings up two results, both medical. The first, a pdf from the NHS, has been updated multiple times. It states - under the heading of 'Caesarean section' - that "compression leggings or boots, should be fitted to all women." There are various other medical discussions of compression tights post-1995, remarking on their alleged health benefits. There is a piece on MayoClinic.com about how compression tights can alleviate deep vein thrombosis. I am sure they don't mean the kind of tights you'd see in grappling, but the principle that "pressure helps reduce the chances that your blood will pool and clot" sounds reasonable (I know there is at least one qualified medical practitioner potentially reading this, so feel free to chip in if you have any thoughts ;D). - Research in flight attendants showed that wearing light level support stockings and tights resulted in a significant reduction in tired, aching legs with discomfort and swelling also reduced. - Several studies have shown that wearing correctly fitted compression garments does prevent post-thrombotic syndrome, a serious and sometimes life-threatening complication of deep vein thrombosis. - Professionally manufactured compression garments, made to prescription, have been shown to reduce healing time in leg ulcers. - In cases of serious injury, such as spinal cord injury, where patients are unable to move their legs, using medical grade compression garments helps to keep the leg veins in better condition, reducing the risk of deep vein thrombosis. It's well known that tights can help you run warmer; now, some high-tech models may help you run better, too. This new generation of tights uses compression to support the major muscle groups, allowing them to function more efficiently and recover more quickly. "It’s based on the science, or art, of kinesiotaping," says John Wilson of Wacoal Sports Science, makers of the CW-X tights. "It’s what athletic trainers have been doing for years to support athletes’ muscles, and in Japan [where the product originated] it’s evolved into an art form." There is another sport (of sorts) which may be the progenitor: pro-wrestling. Looking around the web for old pictures of pro-wrestlers, you can see the legendary Frank Gotch (1878-1917) in leggings from a picture that apparently was taken shortly before his death. As pro-wrestling got increasingly flamboyant and based on spectacle, the costumes became ever more impressive, resulting in numerous examples of men in tights ranging across the colour spectrum. This floral number modelled by the future Governor of Minnesota on the June 1982 cover of Pro Wrestling Illustrated would not look out of place in a Pony Club Grappling Gear catalogue. I would guess that the use of grappling tights in nogi and BJJ emerged from the strong connection between pro-wrestling and MMA in Japan (especially as Japan is name-checked in the RunnersWorld piece above as well), but that's just an assumption. From what I can google, it appears pro-wrestling took off in Japan during the '50s, thanks to Korean-born sumotori Mitsuhiro Momota, better known as Rikidozan. Based on these pictures, he was another fan of wearing tights. A couple of decades later, Antonio Inoki (who famously kicked away at Muhammad Ali's legs in 1976) created 'New Japan Wrestling'. Nobuhiko Takada, who would cross over into the MMA world with PRIDE FC, debuted in Inoki's promotion back in 1980. Searching through PuroresuCentral.com, there were numerous tights afficionados at New Japan Wrestling, such as Mitsuharu Misawa and Toshiaki Kawada, who both also emerged in the early '80s. The person who is probably the most famous proponent of tights for grappling comes from Japanese MMA: Shinya Aoki. His attire was presumably influenced by pro-wrestlers like Misawa and Kawada. The chaps from GiReviews.net point to a useful Aoki tights timeline. In that list, it appears Aoki started wearing his now trademark tights at PRIDE Bushido 12, an event held on the 26th August 2006. 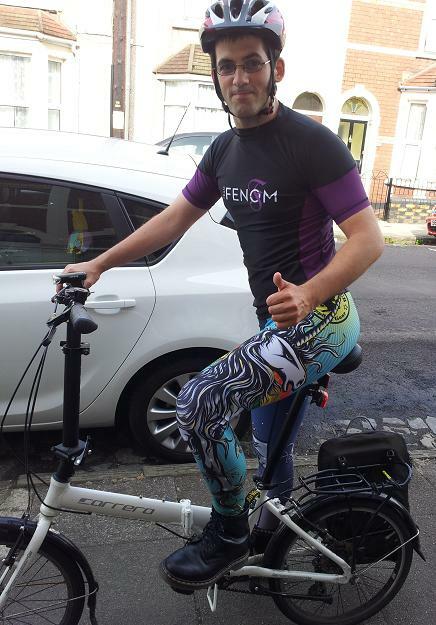 I did not see tights gain much traction in the UK grappling scene until Matt Benyon - at least partially inspired by Aoki, as far as I'm aware - started selling them, using the term 'spats'. He can probably lay claim to being the originator of that description in the UK, in the context of BJJ and nogi (most people would associate 'spats' with '20s gangsters from Chicago, so I'm not sure how it came to also mean 'grappling tights'). Other UK based fightwear companies - like Tatami Fightwear and Black Eagle, then more recently Strike Fightwear - followed suit. Grappling spats are now relatively easy to get hold of, although shorts remain the typical method for covering your legs in no gi. The sizing of the 'Jessica' grappling tights/spats is potentially confusing if, like me, you're not used to wearing spats (well, aside from the occasional drunken night out at university in drag, but those tights would not hold up to sparring ;D). 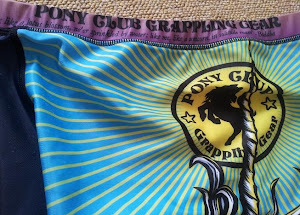 That's because Pony Club Grappling Gear tights will stretch a long way. I normally wear trousers that have a 30" waist, which I thought meant that the Medium size of grappling spats (29") would be the logical choice. The other sizes are Extra Small (23"), Small (26") and Large (32"). I was worried all that stretching might leave the material weak, perhaps resulting in a rip, but so far the Jessica grappling tights have held up well in training. Up until now I have only noticed one potential sign of damage: there was a loose thread poking out by my knee. I didn't realise there could be loose threads by the knee, given that there isn't any stitching in that area. I'm still not entirely sure what that was, but it's simple enough to cut off. The stitching in general looks to be good quality. Previously I have preferred to wear gi trousers for no gi grappling: I don't like having bare knees pressing into the mat. 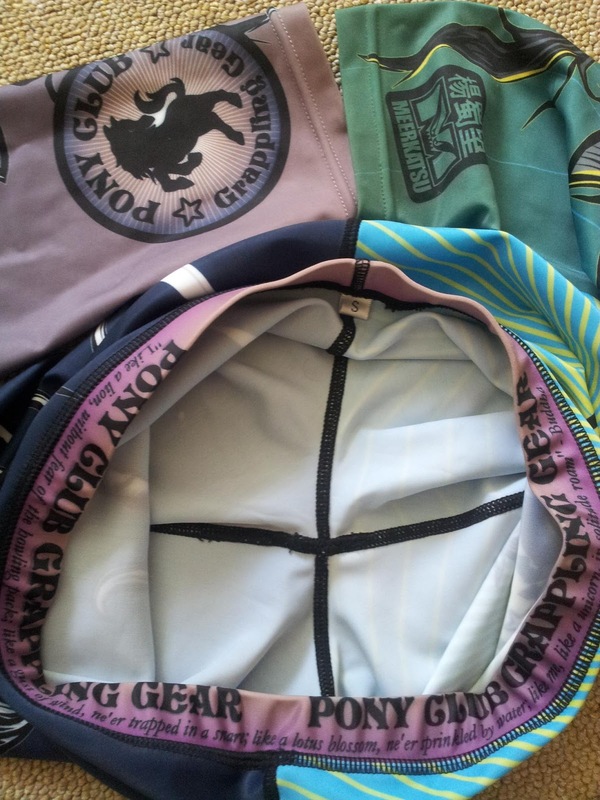 The Pony Club Grappling Gear 'Jessica' tights perform the same function. They're obviously not as protective as the thicker material of gi trousers, but thus far it's been enough of a barrier to prevent mat burn. That should also assist in reducing infections that require broken skin to develop (as from what I understand, cuts, mat burn and other abrasions help bacteria find a route to your bloodstream). You might also expect the tights to ride up or down your legs, but those unicorns remained in place, with no movement from either my waist or ankles. I can therefore confirm there is no need to worry about the spats suddenly slipping and exposing areas you would rather keep hidden. That said, given how snug the PCGG spats are, it does not leave much to the imagination. For the more modest, you have the option of wearing shorts over the top, though having tested that sartorial option, it can get hot if the sun is out. I found it more comfortable to train without the shorts over the top. The slipperiness of the spats helped in terms of escapes, especially as the first time I wore them it was around 32 degrees celsius, due to an insane heatwave the UK was having at the time. On the flipside, one of my training partners mentioned that they found it easier to escape my triangle attempts. Of course, my triangles are pretty bad anyway, but that's worth keeping in mind. You could make an argument that if they do reduce friction once you get sweaty, that means your triangles are going to improve, as you'll have to get the technique that much tighter. I should also note that I am comparing this to wearing gi trousers. If you normally wear shorts, there won't be as much difference, as you'll be used to your legs getting similarly slippery. Wearing them underneath gi trousers was a lot less sweaty than I expected. Although it was relatively hot that day, I never felt uncomfortably sticky, as often happens when I wear a rashguard under my gi jacket. In fact, quite the opposite: with the spats, I actually felt cooler. I also felt more fluid than usual, which I wasn't expecting. That could have just been psychological, but it felt like the spats enhanced my movement, particularly sliding through for guard passes and transitions. I washed them at the usual 30 degrees celsius and air-dried, turning them inside-out first just in case the washing machine had any impact on the colour. The graphics are sublimated, which should remove the possibility of fading, cracking or peeling. The colours did not run, though I was only washing at a low temperature. 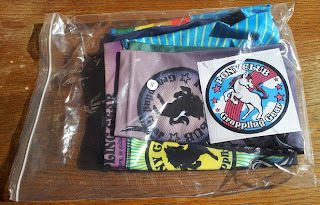 Perhaps due to the moisture-wicking material, the Pony Club Grappling Gear tights were already fairly dry right after I took them out of the washing machine, ready for the mats a few hours later. I didn't notice any shrinkage: measuring them without stretching them at all, the spats remained at 88cm long (69cm inseam), with a waist width of 31cm and ankle width of 10cm. If I yanked them between both hands, then I could without much pressure extend the length to 110cm, the waist to 45cm and the ankle cuffs to 18cm. If you really pushed it, I'm sure that would increase considerably, but I didn't want to risk damaging them. Comparing the cost, I can see other popular spats priced at $54, $59, $69 and $79, so Pony Club Grappling Gear's price of $65 (around £42 at current exchange rates) sounds fairly reasonable. Having said that, it would need to be shipped from Australia, regardless whether it is light enough to presumably qualify for a lower rate. The Jessica is available to buy (while stocks last) here, for $65. For a slightly lower $50, you can plump for the less flashy Yang and Bader spats. 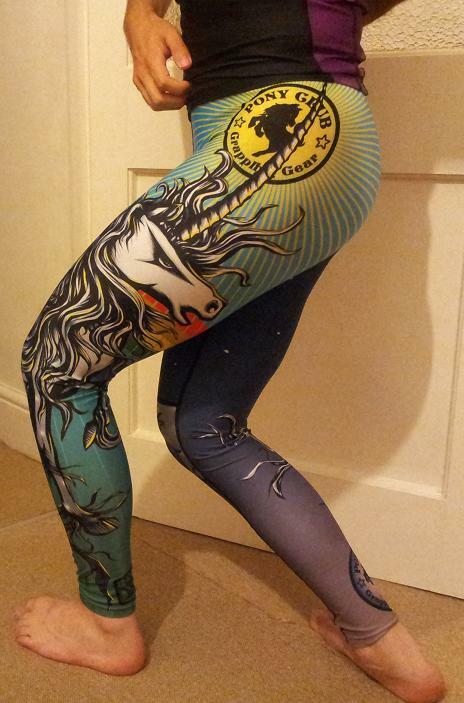 I'm not much of a "tights" person, but I must admit that I would be tempted by Tygra spats. @Kitsune: Tygra was always my favourite Thundercat. Coolest power too, going invisible, although being super-fast like Cheetara is a close second. Great review and that's quite some research work you did on the history of grappling tights! Tygra spats? Might get me training no-gi. @Meerkatsu: Thanks! If anybody reading this has more sources about the history of grappling tights and compression wear, let me know as I'd be interested to do more reading up on it.